NORTH BAY — Burt Parks travels almost 20 kilometers a day. But he doesn’t drive and he doesn’t walk – he takes his e-bike. Park’s e-bike, along with “dozens of others” will be a part of the 1st Annual North Bay E-Bike Show. The show takes place Saturday, August 25th from 1 pm until 6 pm in the Cassells St. Tim Horton’s parking lot. All proceeds for the show will go to e-bike upgrades, vape juice, and towards buying new e-bikes for the victims of sidewalk e-bike collisions. Attendees can expect demonstrations on e-bike maintenance, vendor tables, and a “very short” course on safety. To conclude the 1st Annual E-Bike Show, Parks, Fournier, Bernier, and “anyone else who wants to join” are going to ride their e-bikes on a tour of North Bay. 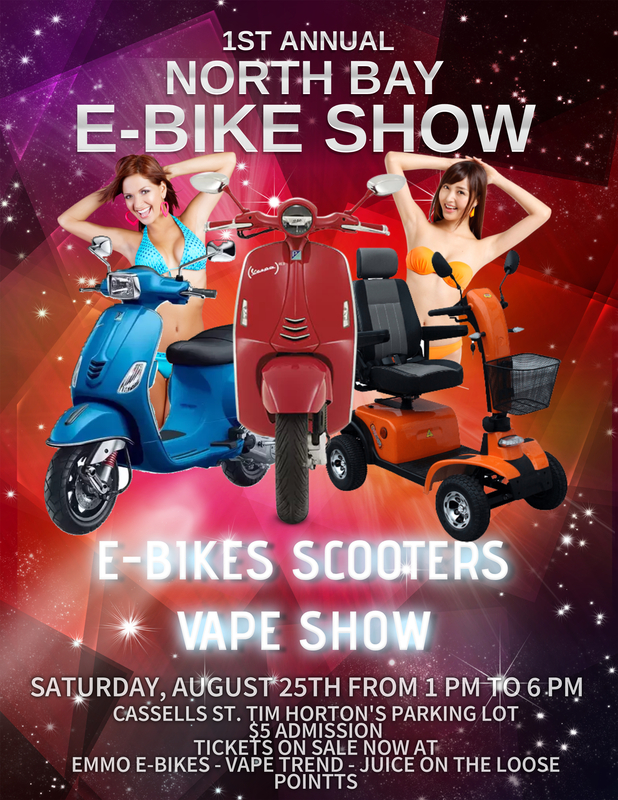 Tickets for the 1st Annual E-Bike Show are on sale Emmo E-Bikes, Vapor Trend, Juice on the Loose, and POINTTS™, The Traffic Ticket Specialists.